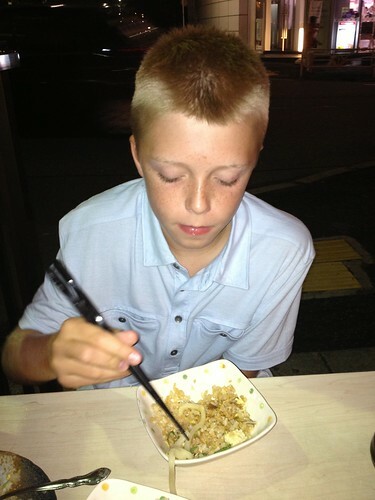 Twelve year old super foodie Carter McCarroll is our guest blogger today. I asked him to share his culinary adventures on his first trip to Japan this past summer (I’m jealous as I’ve never been there except for layovers in the Delta lounge!). Here’s part 1 of this young man’s trip. Hello, my name Is Carter McCarroll. I am a twelve year old boy with a thirst for adventure. I live in Hinsdale, Illinois and I just started going to Hinsdale Middle School. My dad works for Kerry, a company that supplies food and beverage ingredients. One of the main reasons I wanted to go to Japan was the food, but there are many reasons why I love food. Foods from around the world have so much rich history, different textures, and techniques for cooking certain foods. There’s just a whole variety of them! I especially like Japanese food. I just love the intense flavor of sushi when It’s dipped in soy sauce (with bits of wasabi in it) and topped with ginger. I also admire the Japanese udon noodle bowl. Noodles have always been my favorite food and I thought it couldn’t get any better until I tried the Japanese noodle bowl – in Japan! Which I will get into more detail later. That pretty much sums up why I love food, especially Japanese food. We left for Japan on July 21 (a day that I’ll always remember). My dad and I planned that moment for such a long time and the day was finally there and it would just be the two of us flying! I was overwhelmed with excitement. I knew that I’d miss the rest of my family while I was away, since I had never been away from them for so long, nevertheless I couldn’t wait to fly to Japan. When the plane landed, my dad and I felt an urge to eat noodles (even though It was 3 AM in Illinois). So after nearly four hours of train rides from Narita airport to Tokyo, we finally arrived at the hotel. There were a few Japanese restaurants nearby, so we decided to go to one of them. Luckily for us, our waitress could speak a little English. I ordered a beef noodle bowl that came with a side of rice and tempura. After we ordered, I felt so tired that I could just fall asleep sitting right there (It was 7 AM in Hinsdale and I still hadn’t slept – not even on the plane). I was just about to fall asleep when the waitress placed our food on the table. Even though I was literally half asleep, I dug into my food until there was nothing left. Even the rice was about 5 times better than I usually have back in the U.S. I loved the broth for the noodles. 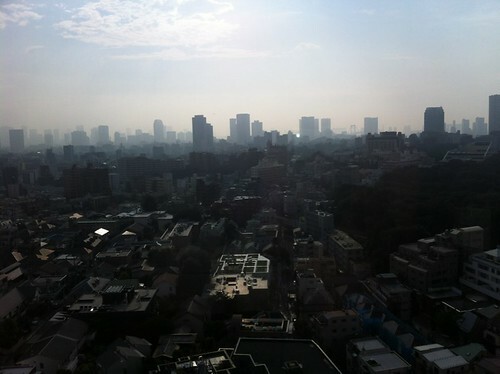 The mixture of everything was almost perfect…… then it was back to the hotel… of course we fell asleep almost immediately. The next day was officially my 12th birthday. We were planning to do a whole lot of exploring that day, but kept it more low-key thanks to jet-lag. After a long day and a nap, we went to a local outdoor restaurant. I still wasn’t very hungry, but I ate something anyway. The best fried rice I ever had! It had the perfect warmth, mixture, and balanced flavor. I felt a lot better the next day. We started off with breakfast in the hotel (which was fantastic!). There was sausages, eggs, noodles, miso soup, steamed rice with many toppings, a whole selection of breads, and so much more. After breakfast we took a cab to see some temples. 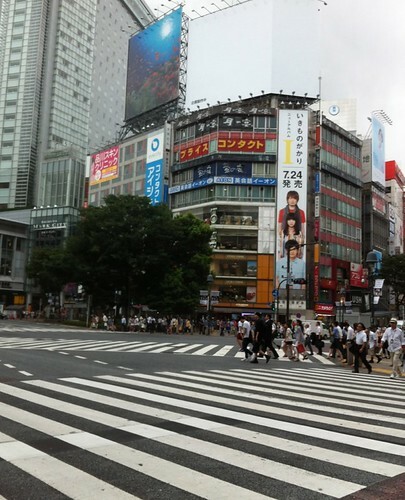 Then we walked to Shibuya crossing, the busiest street crossing in the world! Waiting our turn to cross at the busiest intersection in Tokyo! After some more exploring, we headed back to the hotel to have a snack. We decided to share a small pizza at an Italian restaurant down the street from the hotel. We were actually surprised by how good that pizza was. This pizza was just a margherita. 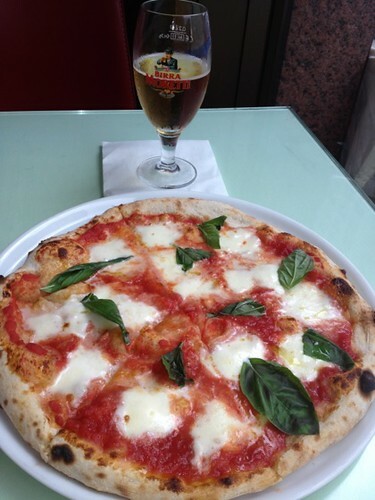 I’m not going to go into much detail about this, but let me just tell you – if you ever travel to Tokyo, stay in the Westin Hotel, and then if you’re In the mood for pizza, go there – its right in front of the hotel. One of the best pizzas that I’ve ever had! 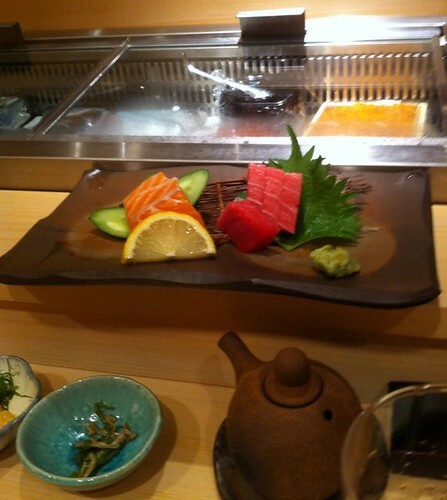 That night, we ate at a fancy Michelin star sushi restaurant. When our taxi dropped us off, it took us a while to find the entrance, but eventually we did. The first thing that caught my eye when we walked in was that this was actually a sushi bar. No tables anywhere and everyone looked so sophisticated. We sat down next to an elderly Japanese couple and right away, the waitress came and asked us what we would like…in Japanese. She was expecting us to instantly know what we were getting, but without an English-translated menu. I’m guessing that the people that come here are mostly regulars. My dad finally worked up the nerve to order with some finger pointing and limited Japanese. Our first course came ….it was a mushroom thing and some other seaweed stuff. I didn’t even dare to try some. Especially after my dad did and said he didn’t like it at all. Next came some nicely cut raw tuna. Finally something that I could eat! It was magnificent! This tender, delicate delight was a perfectly cut juicy piece of tuna that I will never forget. 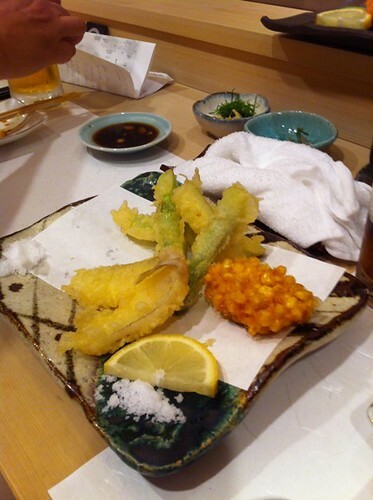 After that, we ordered some tempura. What came as a surprise was they also had fried corn! It was wonderfully sweet and savory at the same time! That was one of the best things I’ve ever eaten in my whole entire life. I think my dad liked it better than I did – he kept on talking about how brilliant it was. Finally, we finished off with some miso soup – which was even better than the miso we had at the hotel. It was perfect blend of warm flavors. After that fabulous meal, we called it a day. Do you have a sweet tooth? I know I do! And I have found some great new books to help you make your favorite local goodies right in your own kitchen! “Molly Moon’s Homemade Ice Cream”, recipes from the local beloved ice cream emporium, features sweet seasonal recipes for ice creams, sorbets and toppings made with local ingredients. I really want to try the recipe for Gingerbread and Cinnamon Ice Cream Sandwiches – Yum! 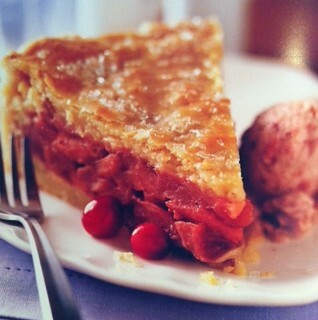 The new cookbook “Cutie Pies” is written by Dani Cone, the owner of Capitol Hill’s High 5 Pie. This book focuses on their signature miniature pies and has great tips for crusts, fillings and toppings. Her Cranberry Nut Cutie Pies would be perfect for your next holiday party! 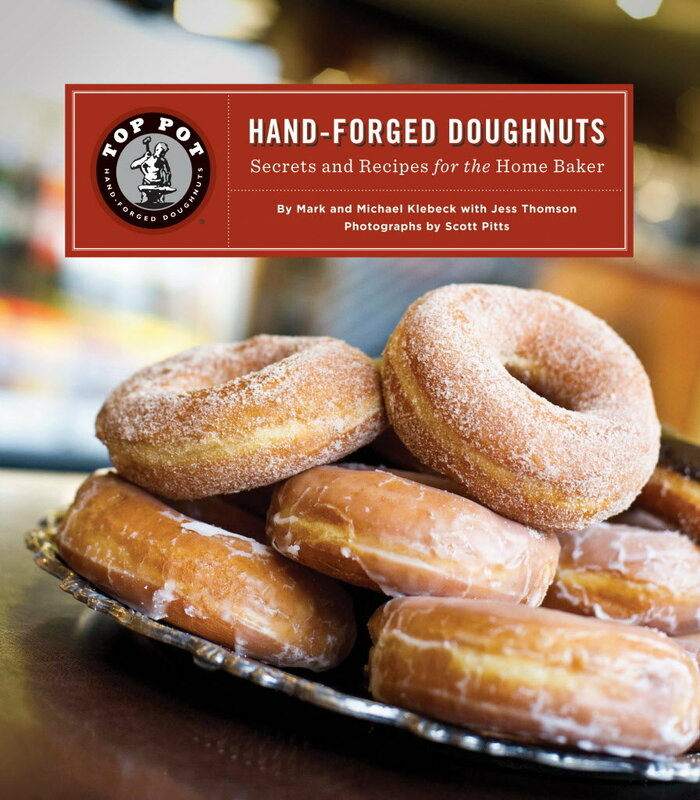 Top Pot Doughnut fans can bake up some fun with their book “Hand Forged Doughnuts”. They reveal secrets and recipes so you can whip up the famed Valley Girl Lemon and Pink Feather Boa doughnuts at home. And then there is liquid dessert… Autumn Martin, the founder of Ballard’s Hot Cakes has a new book: “Malts & Milkshakes: 60 Recipes for Frosty, Creamy Frozen Treats”. Can you say Chocolate Espresso Whisky Malt – YES please! If you are a crafty person and love to make things with your hands whether it’s quilts, jewelry, cake decorating, etc., do I have the website for you! Check out Craftsy, a fantastic online learning center for all sorts of crafts! My friend Cynthia Nims is teaching a cooking series all about French Home Cooking: The Essential Techniques! Her class is already one of the top sellers today, which is very cool. Cynthia’s classes tie into her cooking school roots at La Varenne cooking school in France. She shares many of those basic core French cooking techniques in her lessons, which are great building blocks for you to learn and become creative with! Lessons include vinaigrette and salade verte, beef & mushroom stew, fish chowder, cheese soufflé, a couple potato dishes and homemade rich vanilla bean ice cream. Yum! She’s even shared a link for 25% off her class price. Her entire lesson covers over 2 1/2 hours of instruction with lifetime access! Cynthia has so much wonderful and delicious knowledge to share. I hope you will sign up for her classes! Guest blogger and Food Studio Associate Chef Cameon Orel shares her fondest of memories about fall and watching her Nana cook up wonderful meals. I love this time of year. The long days of summer have now faded, and the bbq is no longer the main source of cooking equipment. Fall is crisp filled with the promise of a new year. Kids dressed for the school bus, trees turning to the jeweled colors of autumn and I am magically transported to my Grandmother’s kitchen. My Grandmother, let’s call her Nana, any other name would not be right. She had the ability to transform the simplest of foods in to a feast. During this time of year I would find her surrounded by the harvest of the garden. She was a year round gardener. Her garden supplied our family and many other families in the neighborhood with a year round basket of magic. She would mindfully fill baskets with kale, chard, winter lettuces, squashes, zucchini, radishes, and the late round of beans-CSA before it was cool. I always enjoyed watching her out my bedroom window with her apron held up to hold the three types of apples soon to be turned in to a crisp for our dinner that night. Often she would sit with various cookbooks and clippings planning the next few weeks’ meals. As I write about this I am mesmerized by how effortless she made it all seem. At any given moment she could have a cake in the oven, cow’s tongue on the stove, cucumbers pickling to be put up, dark chocolate and vanilla pudding setting for a snack and my favorite cookies in the freezer ready to bake. My most memorable meals in her home involved very few ingredients; a Hubbard squash that she made in to a curry spiced soup, green apple and winter kale salad with dried fruits and nuts, braised Ox-tail served with homemade pork sausage and braised small heads of romaine, potatoes still musky from the dirt slowly roasted with hand churn butter. These foods may not sound like a young girls dream but it was what I knew, I grew up smelling the simmering pots, the steaming vapor’s of a freshly opened oven. I held the jars as my Nana pickled and stewed pumpkin for her famous pumpkin apple spice cake. Nana’s cookbook and notes – perfect for inspiring fall meals. So as the trees begin to change, the light dims, and the sun glistens on the dew filled spider webs. I am blissfully happy to know that it is time to pull out my Nana’s cookbooks, filled with her notes of lower the salt, great with a touch of nutmeg, great recipe and must make this for Aunt Betty, exchanged recipes from dear friends. I thumb through these ear marked and yellowed pages I am inspired to fall in love again with the cycle of cooking. I am reminded of a woman who many years ago knew that the best food comes from the earth. Getting D’Lish with In the Mix Magazine! The new issue of In the Mix magazine is available online; check out Creative Director Kester C. Chau’s fantastic write-up (page 94) of her Deviled Egg & Cocktail Brunch featuring three of my recipes from D’Lish Deviled Eggs! Cheers to that! Washington State and apples – they go hand-in-hand AND there is so much you can do with them. How about dessert? There is nothing more classic than warm apple pie, but even this beloved recipe can stand a new twist. Try adding in grated cheddar cheese to the crust and tossing some local cranberries into the filling for my Apple Cranberry Pie With Cheddar Cheese Crust. A match made for the fall as apples and cranberries are both in peak season. Who’s ready for pie? I know that I am! And apples aren’t just for desserts, try adding diced apples into a chili! My Stadium Apple Chili recipe combines diced Fuji apples with chilis, pork sausage and beans. The Fujis are nice because they keep their shape and add a touch of sweetness – perfect for tailgating and definitely oh-so northwest! For an easy appetizer I like to make a Spicy Apple Onion Compote. Sauté diced apples with a little onion until just barely tender, then add in some red pepper jelly – YUM! Serve this on top of crostini or rustic crackers with a smear of goat cheese or a slice of brie and a sprinkle of toasted hazelnuts. Perfect for your fall party entertaining! Fuji apples are incredible. Not only do they have a wonderfully clean, sweet flavor, but their cooked texture is amazingly firm. A great shape-holder! You’ll be a true Fuji fan when you try this recipe! Peel, core and dice the apples into 1/2″ cubes. Set aside. Meanwhile, heat oil in a large Dutch oven over medium-high to high heat. Add the meats, stir occasionally and cook till meats are browned and no juice remains. Add onions, peppers, garlic, chili powder and spices. Stir in well, and cook stirring constantly for 1-2 minutes, being careful not to scorch chili powder. Add beef broth, beer and tomatoes. Combine well and bring to a simmer. Reduce heat and simmer uncovered for about 15 minutes. Add apples and beans and return to a simmer, cover and cook for about 20 minutes or until meat and apples are tender. Season with salt to taste. Serve with Chili Toppers of your choice. Vegetarian option: Substitute 1 pound peeled, 1″ cubed winter squash (such as Hubbard or pumpkin) for meats and an apple juice and vegetable broth mixture for beef broth. In a food processor pulse the apple and onion until they are chopped into 1/4- to 1/3-inch pieces. In a medium skillet melt the butter over medium-high heat. Add the apples, onions and ginger. Sauté for about 5 minutes until apples and onions are just tender. Add the lemon zest, vinegar, pepper jam and currants and bring to a boil. Let boil about 2 minutes until loose and chutney-like. If compote gets too dry while cooking, add a tablespoon of water. Remove from heat and cool.